The architecture of the Agra Fort is worth mentioning and is built using red sandstone. This sprawling fort complex in Agra has an architecture that tells us about the varied cultures that existed during the Mughal Period. There are various building and monuments inside the Agra fort that are unique in nature and worth watching. A visit to the Agra Fort will be a treat to all travellers who are interested in ancient architecture, monuments and heritage of India. The Jahangiri Mahal or Jahangir’s Palace was the principal palace for women belonging to the royal household and were mainly used by the Rajput wives of Akbar. An amazing gateway leads to an interior courtyard of the Palace, which is surrounded by grand halls and are covered with profuse carvings on stone, piers, crossbeams and heavily fashioned brackets. The Jahangiri Mahal inside the Agra Fort is one of the most important building during the reign of Akbar. 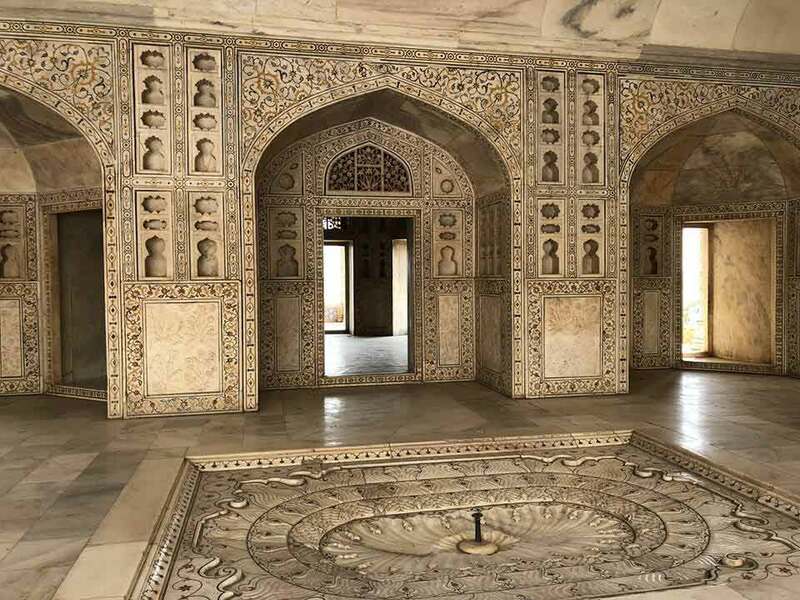 The Khas Mahal that is present inside the Agra Fort is an enclosure that was built by Shahjahan and is noted for its charming Mughal architecture. The Khas Mahal overlooks the specially laid Angoori Bagh which is a grape garden and a simple formal Mughal garden. The Windows of the Khas Mahal are closed with jali which is a type of decorative stone screens and they provides an amazing view of the riverfront. There are also two copper-roofed pavilions inside the Khas Mahal that is built according to the Bengali traditions and these pavilions were meant for prominent ladies of the harem. The three sides of the garden consists of the residential quarters for women. Musamman Burj is an octagonal tower standing close to the Shah Jahan’s private hall Diwan-e-Khas inside the Agra Fort and is also known as the Saman Burj or the Shah-burj. The Musamman Burj was built by Shah Jahan and was constructed using delicate marble lattices with ornamental niches. The chamber of Musamman Burj has a marble dome on the top and also has a beautiful fountain in the center. Overlooking the river Yamuna, the Musamman Burj provides an amazing view of the Taj Mahal. Diwan-i-Khas is another building located inside the Red Fort and is also known as the hall of private audiences. The Diwan-i-Khas is a rectangular chamber with high arched openings wehre the Emperor used to conduct meeting with heads of state and high ranking officials. The famous Peacock Throne of Shah Jahan was present at the center of the Diwas-i-Khas and it was looted by Nadir Shah in in the year 1739. The present wooden ceiling of the Diwan-i-Khas hall was painted in the year 1911 and the four corners of its roof are surrounded by pillared chhatris. The Diwan-i-Aam inside the Agra Fort is also known as the Hall of Audience. The Diwan-i-Aam is a room in the Red Fort where the Mughal emperor Shah Jahan and his successors used to receive representatives of the public to hear their grievances. Eventhough this building is built in red sandstone, it has been plastered with white shell plaster so as to resemble the white marble. This building is one of the major attractions of the Agra Fort and is well noted for its unique architecture. Weather is a major factor that can influence the outcome of your trip to Agra and especially during the summer, the temperature rises to around 45 degree and above. This makes it difficult for those who are not familiar with such type of climatic conditions. The summer season is from March to August and visiting Agra and its travel attractions during this period is not highly recommended. The best period to visit Agra Fort would be from September till the first week of March as the climate will be cool and you can also experience the amazing winter season during the months from November to February. Agra can be reached by air, as the Kheria Airport (IATA) in Agra is open on a seasonal basis and the next nearest airport is at Delhi which is around 193 kilometers away. Agra is having a railway station and is also well connected to the other major cities by road. So reaching Agra is not a huge task as far as transportation is considered. There are many tourist cabs and buses plying from other cities to Agra during the peak tourism season, and travellers can book in advance and make their trip to Agra more comfortable. Local trains will be heavily packed and it will be better if you go for reserved seat bookings in the train. Since there are a lot of things to see in and around Agra, most of the travellers tend to stay in Agra for atleast a day. There are many hotels, resorts and other accommodation facilities available in Agra and this is not a matter for worry. There will be budget hotels, luxury hotels, heritage hotels etc in Agra to serve the travellers coming from different parts of the world. Most of the hotels in Agra offers accommodation of world class quality and amenities, as they expect travellers from different parts of the world. During the top tourism season, you need to book your accommodation well in advance so that you can make your stay at Agra more comfortable and make your trip a memorable one. 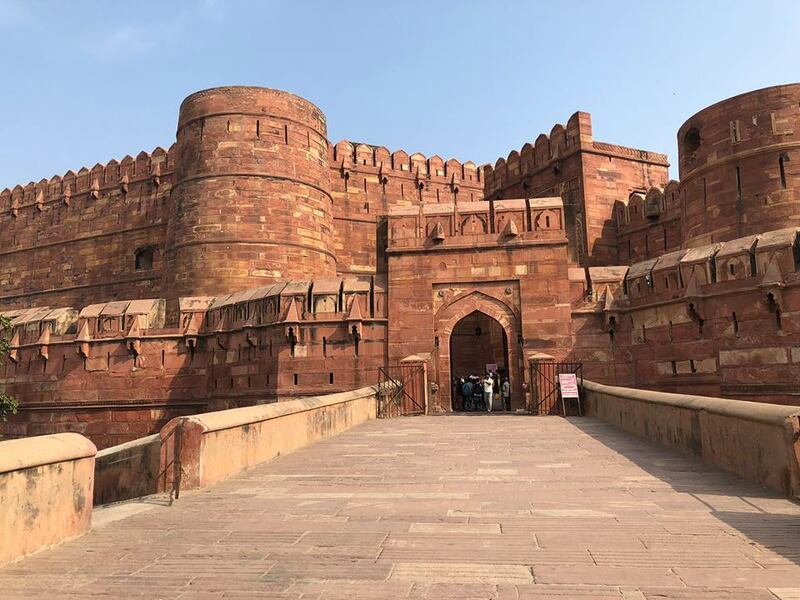 This entry was posted in Agra and tagged agra fort tourism, agra fort travel, buildings inside agra fort, complexes inside agra fort, monuments in agra, monuments in india. Bookmark the permalink. Both Agra and Taj Mahal are unique in their own ways Sinjana..Both have their own beauty and historical importance. Thanks that this post took you back to your past memories..